Humans are wired to work visually. We can formulate 3D images in our heads through reading text and by looking at 2D images, with varying degrees of success, but there is simply no substitute for designing and reviewing projects just as we live our lives… in 3-dimensional space. The phrase “a picture is worth a thousand words” carries no less weight when applied to the field of design engineering. When engaging in a project where people will be operating around, or directly with, equipment in the project’s scope, projecting yourself into the space by leveraging 3D scanning services is the most effective way to illuminate safety concerns before any work begins. Project Risk Management is key to avoiding the numerous challenges in implementing a retrofit plan. Upgrading, replacing or expanding equipment is both challenging and difficult if proper planning and risk analysis is not undertaken. When delays or downtime can result in significant negative outcomes, project risk management becomes more than a matter of efficiency and becomes a matter of necessity. 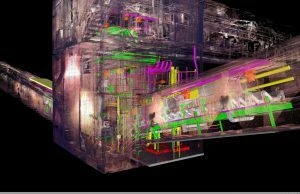 Acensium leverages 3D laser scanning and 3D modeling technology to evaluate the engineering demands of material handling or retrofit engineering projects. Whether through cutting-edge Virtual Reality (VR) or Augmented Reality (AR) or by incorporating avatars into computer models on a laptop screen, there is nothing as powerful or as accurate as personally experiencing and observing how the human form will interact with elements within a retrofit or new construction project. Every project has its unique concerns when it comes to safety. Project teams can visualize and address concerns with 3D models created through 3D scanning services. The project design and planning process sometimes goes through several iterations before all parties, regulations and protocols are satisfied and before the design is approved to move forward. The trial and error process involved in efficient material handling engineering can be daunting. Dozens of testing and simulation iterations, often with long simulation rendering times, mean that to meet tight deadlines the process must be both efficient and effective. 3D scanning services convey the ability to visualize objects in three dimensions, while simulation adds the ability to step into 4D modeling (the 4th dimension is time, which creates animations) delivering a powerful toolset! Animations not only allow the team to bring motion and movement into consideration for the design; animation can be used to create procedural and safety training videos that can be 1000% more descriptive than a manual could ever be, and 2000% more likely to be watched by your employees. Because of the time-sensitive nature of most projects, Discrete Element Modeling (DEM) simulations become as much art as science, requiring educated decisions on what to simulate and test. Materials may have variable conditions, such as varying water content depending on uncontrollable environmental variables. Understanding this reality and accounting for it in the model is only possible with accurate data gathering coupled with repeated simulations. Some materials may have critical limitations on some variables, where the material is damaged or destroyed by excessive force, heat or some other environmental condition. Calculating these variables in the design process can only be only possible with adequate data-gathering efforts. Project delays can be costly. Complex installations or retrofit projects often have many moving parts and operate with tight physical tolerances. Certain components may have millimeters of clearance with the existing structure, cable runs or conduit. Manual measurements are prone to mistakes and often are not as comprehensive as they could be, leading to assumptions that cost the project time and money. If an when new measurements are needed for planning, they have to be taken manually, on-site. An unexpected clash during installation is always challenging. Depending on what components are involved, it can be devastating to project progress. Can cuts be made? Do parts have to be reordered? How much downtime will there be? With labor and delays costing time and capital, contingency budgets can be quickly consumed when things don’t fit. 3D scanning services can turn any area or environment into a 3D digital representation with millimeter accuracy. This environment can be used to take virtual measurements or plan any project. The latest advances in scanning equipment mean that scans are quick and efficient providing the team true, as-built conditions for planning. New scans during a project often can be completed while the team is out to lunch. These up-to-date as-built scans allow for project planning but are also an asset for continued design. 3D scanning services are well known in many industries for equipment design and undertaking complex material handling optimization projects. High-cost, long-term projects aren’t the only projects that can benefit from 3D scanning services. The costs of 3D scanning services have dropped as the efficiency and speed of 3D scanning has increased. Many projects have risks for clashes with conduit, piping or cable runs with tight-fitting or complex installations. Understanding, with millimeter accuracy, the exact position of every object in the project area reduces risk delivering projects on time and on budget. 3D scanning services for project analysis and project risk management deliver tens of thousands of dollars worth of savings if just a single issue is detected. A problem with conduit or sleeve alignment, or other issues discovered only after the concrete is poured, can pose severe problems and considerable costs. A 3D scanning services partner with experience and skill makes 3D scanning a versatile and valuable tool. 3D scanning is quick and accurate, providing project insight and risk management that helps ensure projects are completed on budget and on-time. Whether it’s new construction, renovation or retrofit projects, 3D scanning services provide architects, engineers, BIM managers, general contractors, and construction managers with the information and insight to fix issues and make critical decisions before they cost time or money.